Not looking to drop $360 bucks on a gadget purposed almost solely for book reading, but still want to partake in Amazon’s new found love for eBooks? You’re not alone – and if you’ve got an iPhone or iPod Touch, you’re in luck. As we’d assumed they would, Amazon has just launched a free Kindle application for Apple’s much-lauded touchscreen, available immediately. While it won’t go and turn your iPhone’s display into an e-Ink screen (we feel bad for our eyes already), the Kindle application does replicate much of the functionality provided by the namesake device. You can read any Kindle-compatible book you’ve purchased from Amazon’s catalog, read the first chapter of other books for free, adjust text size, bookmark pages, and view notations made on the Kindle. One of the big features here is WhisperSync, which automatically keeps track of where you left off in each book, allowing you to pick up from that spot from any Kindle-friendly devices you may have. The feature didn’t seem too useful when the Kindle 2 was announced (How many people have more than one Kindle?) – but with Amazon stretching Kindle across multiple platforms, it makes perfect sense. Leave your Kindle on the bed side table, pick up where you left off on your iPhone once you’re on the bus. Buying new books is a bit more tedious for iPhone users, as Apple doesn’t allow third parties to sell content within their applications. To get a new book, you’ve got to pop into Safari, then head to the standard Amazon Kindle store and purchase the book there. Amazon’s syncing sorcery takes over from that point. It’s not too bad, but the experience isn’t as seamless as it is on the Kindle. Will this put Kindle device sales at risk? Not likely. The Kindle is a fairly niche product – not that reading is a niche activity (though it’s probably a bit less common than it should be), but the ideas of eBooks/e-Ink/etc are still fairly foreign to most (though Oprah’s mention definitely didnt hurt). This lets Amazon push more copies of e-products they’ve already got licenses for, all the while coaxing the stubborn folks into the idea of reading books on an electronic screen without requiring them to drop $360 bucks on a dedicated device. What it may put at risk, however, are all of the other publishers (ScrollMotion, for example) looking to peddle eBooks on the iPhone platform. Amazon’s eBook library is massive, and almost always cheaper than these other options. 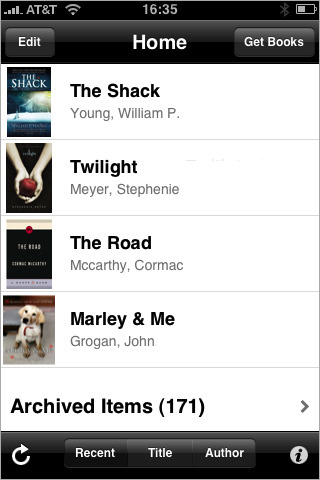 Has Amazon just conquered the iPhone eBook market?